Today, millions of women are celebrating International Women’s Day by participating in “A Day Without a Woman.” In our nation’s capital union women and allies are participating in the Women Workers Rising rally in the afternoon to demand dignity and respect. 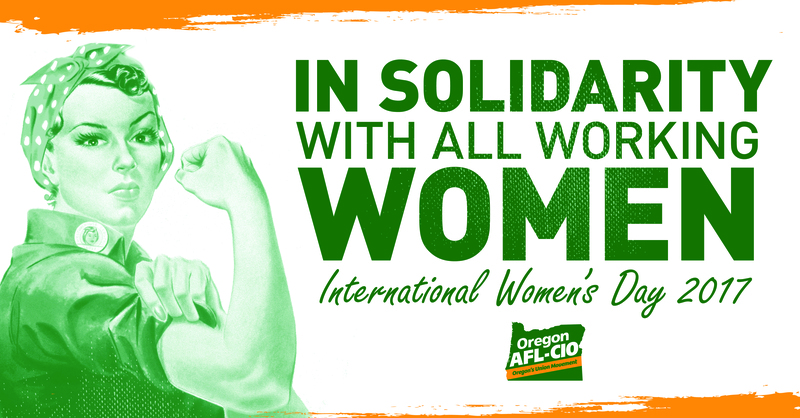 The AFL-CIO and its 12.5 million working people are proud to celebrate International Women’s Day. Today, and every day, we stand in solidarity with working women in the wake of unprecedented hostile rhetoric aimed at women by elected leaders and attacks on the rights of all workers. As we join union women and allies, we send a clear message to politicians: the status quo is not working and it is time for you to pay attention. Every day, women workers are subject to sexual harassment and violence on the job. Women workers are indispensable, yet are still paid less for doing the same work while also taking on greater responsibility in their homes. On International Women’s Day, we recommit to fighting for equal pay, paid family leave, affordable child care, health care and, most importantly, dignity and respect. on the job. We know that when working women stand together in a union, great things happen. But when unions face continued threats and attacks, working women suffer. Over the last 35 years, one-fifth of the rise in wage inequality among women can be explained by the erosion of collective bargaining, which raises wages for all working people. Millions of working people will lose health care coverage, thanks to a plan introduced by Congressional Republicans. This haphazard “repeal and replace” effort would result in painful taxes on working families, cuts to Medicaid, and tax giveaways for the super-rich. Of all the bad ideas in this flawed plan, forcing workers to pay a so-called “Cadillac tax,” on employer provided health care has to be among the worst. That’s a terrible plan for healthcare in America, and the impact on working people cannot be overstated. 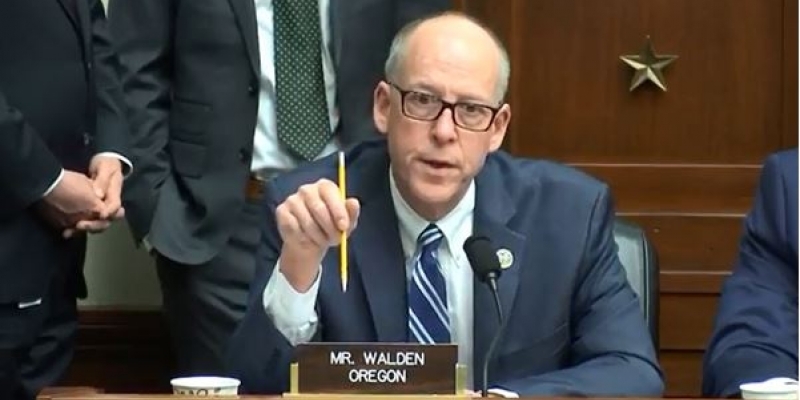 …a new report of the consequences of repealing the ACA from the House Democrats highlights aa new report of the consequences of repealing the ACA from the House Democrats highlights an extraordinary fact extraordinary fact—Walden's district, which covers 20 Oregon counties and an area about the same size as New York, New Jersey and Connecticut combined, added more new Medicaid recipients under the ACA than any of the congressional districts in GOP control and all but three Democratic districts (New York's 7th, 13th and 15th districts). The reality is, this isn’t a healthcare plan at all. It’s a massive transfer of wealth from working people to Wall Street. For more than a century, the labor movement has fought to make health care a right for every American. The plan to dismantle the ACA contradicts that very idea by making care less affordable and accessible. It’s bad for healthcare, it’s bad for working families, it’s bad for our economy and Oregon’s unions will fully oppose it. We will keep you updated with the latest information on this important issue as it develops in Congress. Last night the Senate voted along party lines to roll back the Fair Pay and Safe Workplaces Act, an Executive Order signed by President Obama which required federal contractors to disclose labor law violations and work with the government to correct violations before competing for federal contracts. 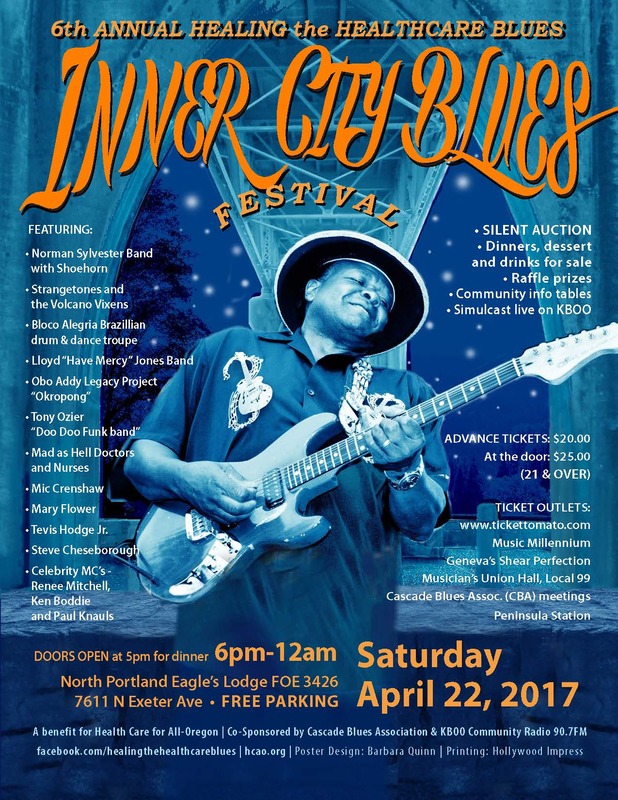 The 6th Annual Inner City Blues Festival, “Healing the Healthcare Blues,” returns April 22nd to the North Portland Eagles Lodge, 7611 N. Exeter. (at Lombard). Doors will open at 5:00 p.m. and music runs until midnight. The event is a fundraiser for Health Care for All-Oregon, an advocacy organization working to bring an equitable, affordable, comprehensive, publicly funded health care system to all Oregonians. Admission $20 in advance: www.tickettomato.com  or at Music Millennium, 3158 E Burnside; Geneva's Shear Perfection, 5601 NE Martin Luther King Jr Blvd. ; Peninsula Station, 8316 N. Lombard; Musician's Union Hall, 325 NE 20th Ave. Tickets are $25 at the door.